An adult Great Plains Ratsnake from Otero County, Colorado. Photo by Andrew DuBois. BLUE = known historic occurrence. Identification Gray to light gray in color, with dark-edged brown to dark grey blotches along back and sides; dark lengthwise stripe typically stretches across eyes, sometimes forming a point; dark square blotches on belly and stripes on underside of tail. 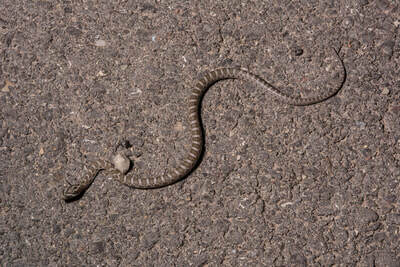 The body of the snake is smooth, with weakly keeled scales on its back and a flat belly; adept for climbing. 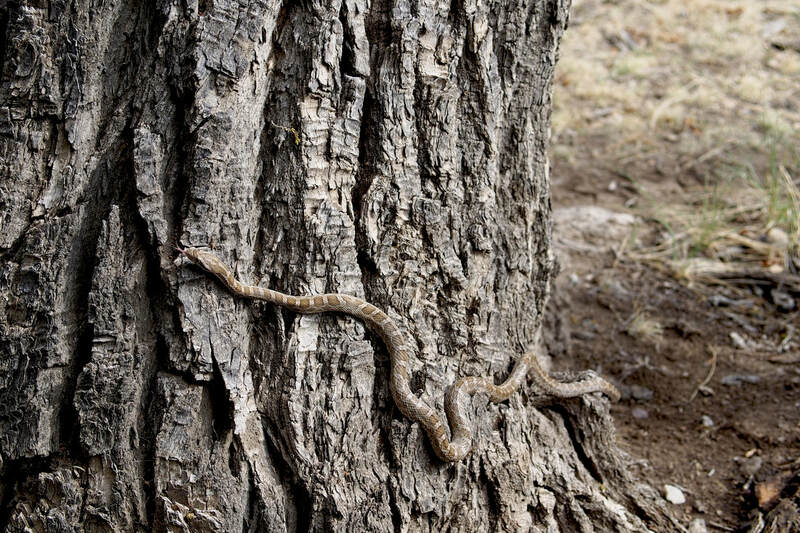 They are typically less than 49 inches in length, but in western Colorado average between 23-31 inches. Habitat Most often found near rivers and streams, the Great Plains Ratsnake occupies grassland, shrubland, coniferous forest and rocky hillsides in or around canyons; can also be found near rural homes and semi-agricultural areas. Activity Primarily active between May-September. During periods of inactivity they occupy burrows and abandoned buildings for hibernation. Most often seen around dusk during the warmer months, as they are primarily nocturnal at this time. Diet As its name suggests, this species feeds predominantly on rodents; it has also been documented to eat birds, frogs and lizards. The Great Plains Ratsnake utilizes a combination of sit-and-wait and foraging hunting strategies, usually killing its prey by constriction. Predators The most often reported threats to this species are primarily human-caused. 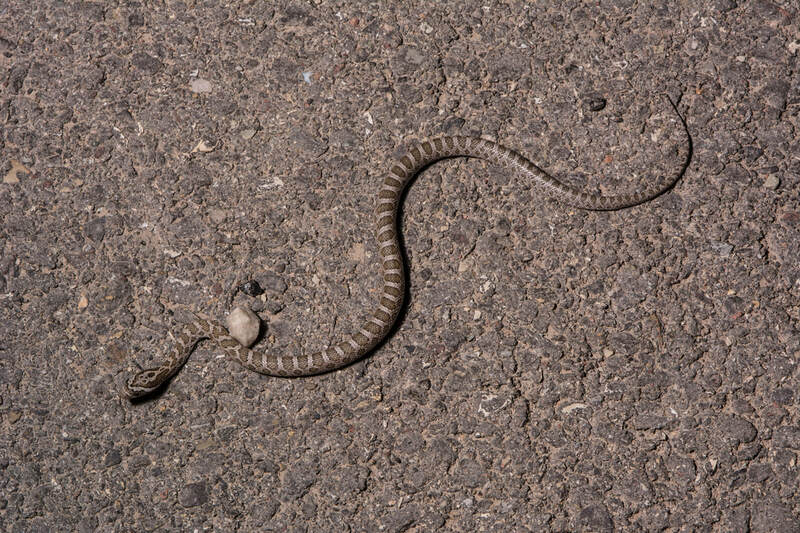 Development of rural land for agricultural use and highly trafficked roads are responsible for the deaths of many Great Plains Ratsnakes. 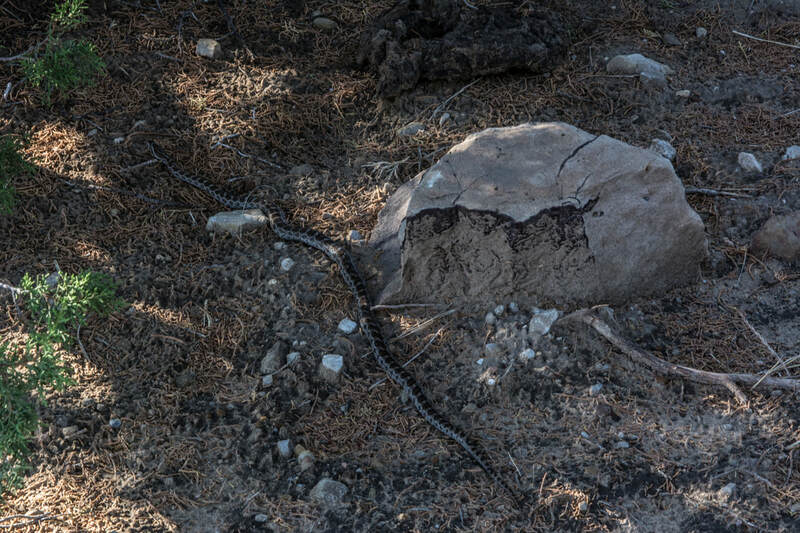 Defensive behavior The Great Plains Ratsnake will most often defecate and release fluid from its cloacal sac when caught, but has been known to bite as well. It will also vibrate its tail when threatened and, though this species is harmless, this behavior sometimes causes it to be misidentified as a rattlesnake and result in it being killed by humans. Reproduction Copulation occurs approximately 3-4 weeks after emergence from hibernation, and clutches of eggs are laid between May and July. Clutch sizes vary across their distribution; in western Colorado clutches contain 5-8 eggs, while in the plains can contain an average of 16. Eggs are incubated for 55-58 days around 80 degrees Fahrenheit. 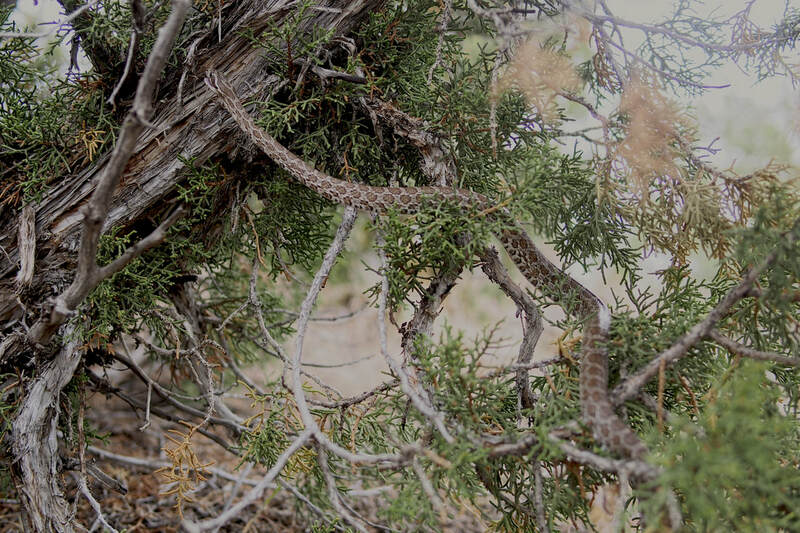 ​Conservation and status The Great Plains Ratsnake is considered a non-game wildlife species, meaning they cannot be handled or possessed without proper licensing granted by Colorado Parks and Wildlife. 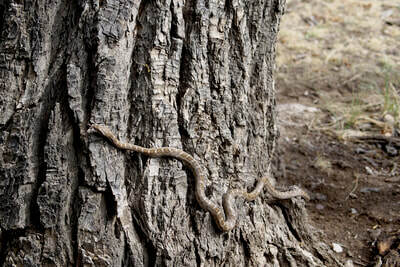 According to recorded observations, the Great Plains Ratsnake has stable populations across much of its range and is not a species of conservation concern. 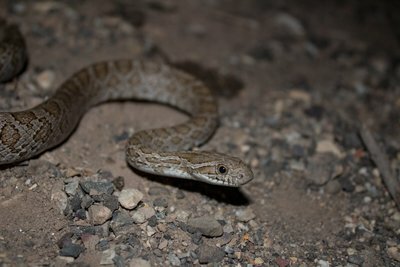 This ratsnake is tolerant of rural development and expansion, but large-scale, intensive land conversion for agricultural use can reduce population sizes. 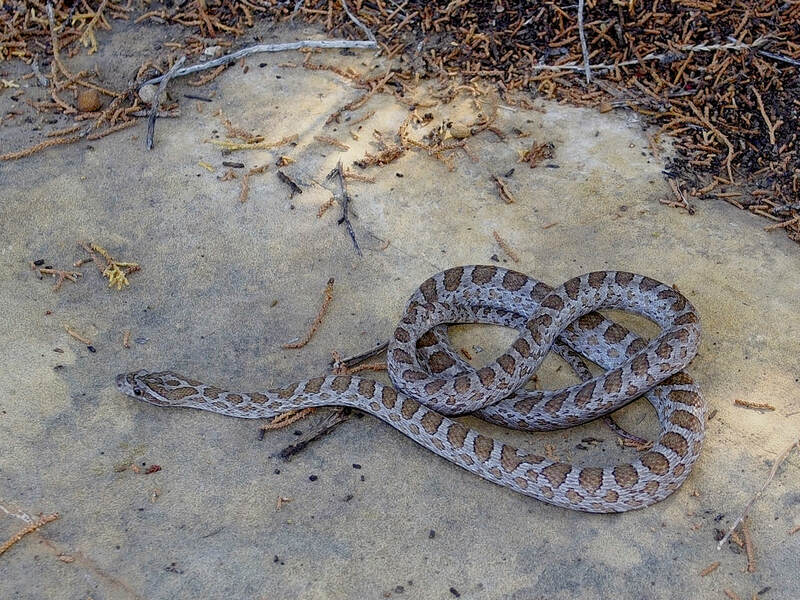 Suggested citation Colorado Partners in Amphibian and Reptile Conservation. 2018. 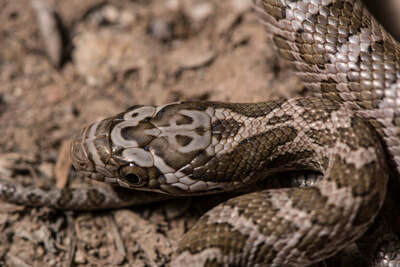 Great Plains Ratsnake (Pantherophis emoryi) Abbreviated Species Account. Compiled by Stephanie Townsend. 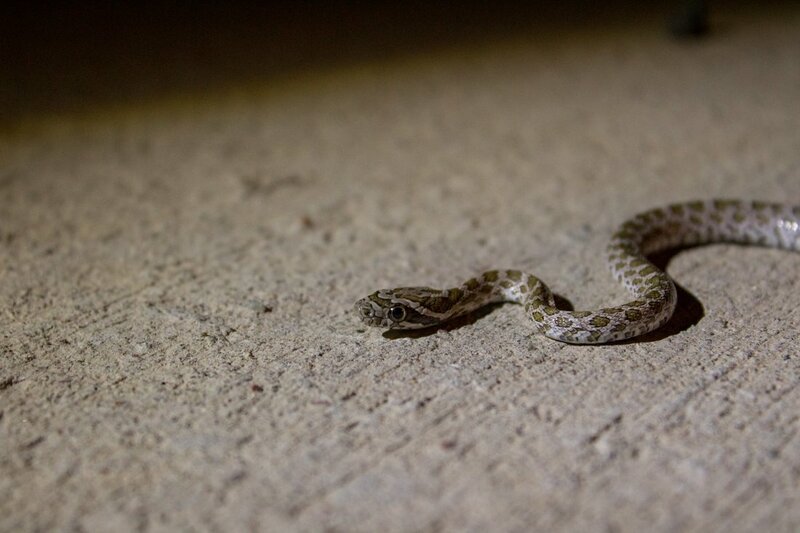 http://www.coparc.org/great_plains_ratsnake.html [accessed date here]. ​Last updated 2 October, 2018. Ford, N. B. and Cobb, V. 1992. Timing of Courtship in Two Colubrid Snakes of the Southern United States. Copeia, Vol. 1992, No. 2, p. 573-577. Hammerson, G. A. 1999. Amphibians and Reptiles in Colorado. 2nd Edition. University Press of Colorado, Niwot, Colorado. Stebbins, R. C. 2003. 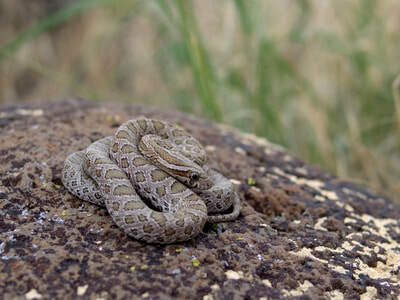 Western Amphibians and Reptiles. 3rd Edition. Houghton Mifflin Company, New York, New York.